By default, there are no borders (also called “strokes”) when starting an album. However, you can set the default image borders during the album set up process. 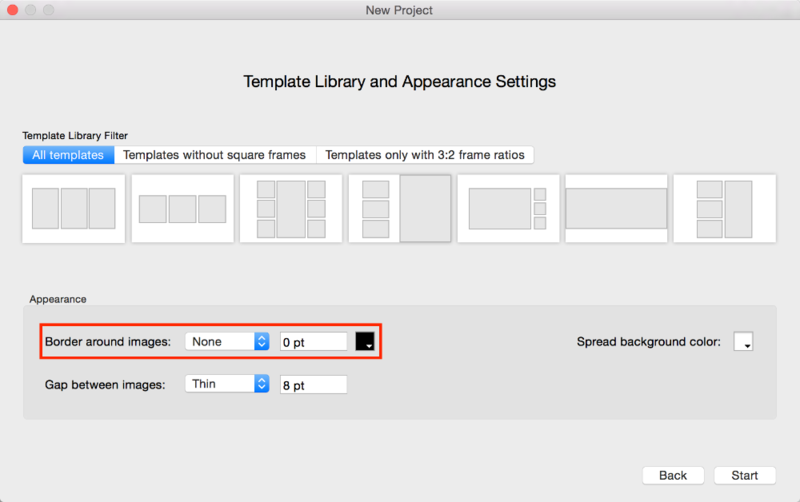 When starting a new project, in the second window, you can set the default border color and thickness. You can choose one of the preset thickness values or set a custom width. For each album size, there is a maximum border thickness value. If a value set is higher than the maximum value, the input will reset to whatever the maximum is for that album. Border thickness values are set in “point” units. 1 point (pt) equals to 1/72 of an inch. You can also choose to change the border color by clicking on the color picker. Select one or several images in the album. Use the Border slider in the Inspector on the right to change the border thickness and the color picker to change the color. Select the first image in the Timeline. Hold down the shift key (⇧) and select the last image in the Timeline.